The PSA are commissioning a carpenter to build us two mobile libraries, one for each of our playgrounds. 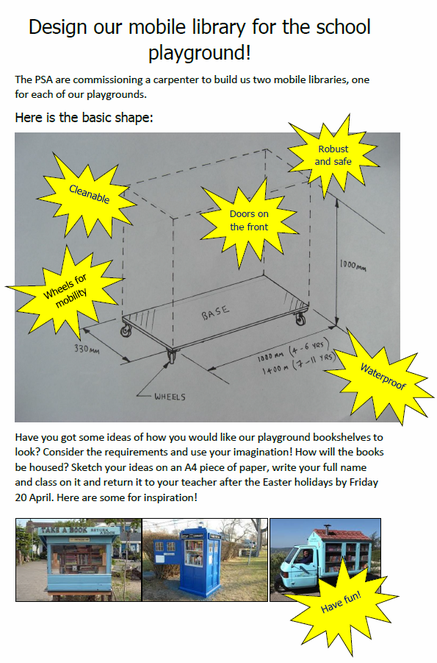 Have you got some ideas of how you would like our playground bookshelves to look? Consider the requirements and use your imagination! How will the books be housed? Sketch your ideas on an A4 piece of paper, write your full name and class on it and return it to your teacher by Friday 20 April.